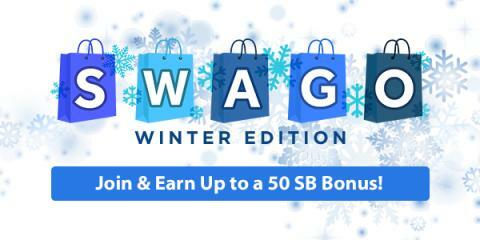 The holidays are close, and the online rewards site Swagbucks has a smart and fun way for you to earn and save while you spend. • Click here to go directly to the Swago Page! If you're not a member yet, you can join here - it takes 30 seconds. Make sure you hit Join otherwise you won't get credit for completing the action items. Each square on your Swago Board will contain an action item to complete. • Once you complete the action item in a particular square, the square will change color signifying the action item is complete. • You have a limited amount of time to mark off as many squares as possible, so use your time wisely. • The game ends Friday, January 26th at 12pm PDT/3pm EDT. So make sure to hit Submit on the pattern you wish to submit. If you don't hit Submit before the game ends you won't receive your SB bonus.